In October 2008 Moishe/Kavod House kicked off the campaign now known as Farm to Shul: Boston’s Jewish local agriculture campaign. This campaign, incubated at the Moishe Kavod Jewish Social Justice House in Brookline, MA is currently focused on educating about, and increasing demand for, local agriculture and Community Supported Agriculture (CSA) shares in the Jewish community in Brookline, Brighton and beyond. Our latest project is a retreat and farming day at Adamah Farming Fellowship, on August 22nd-24th. Come with us to Western Mass for some camping, texts studies, Ag policy learnings, and just good ol’ Shabbas fun in the sun (lake included). 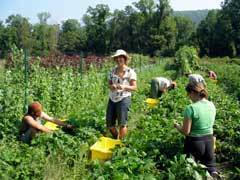 Plus, on Sunday we will be going to Isabella Freedman to work on their farm and learn with the Adamah fellows! For more information, please e-mail Meira Soloff.